Monrovia, Liberia - The President of Liberia, His Excellency Dr. George Manneh Weah, has eulogized fallen Executive Protection Service (EPS) officer, Rufus B. Clarke, for his diligent service and commitment to duty and loyalty to the state. President Weah said the late 1st Lieutenant Clarke was a brilliant and intelligent man who was always willing to serve. The President spoke at the funeral of the late EPS staff held Saturday, April 6, 2019 at the Forward In Faith Ministries in Barnersville. The Liberian leader told the wailing congregation of friends, workmates, well-wishers and relatives that the fallen officer also served with distinction. Last year, the late officer was awarded service medal of distinction by the President for commitment to duty as well as the neatest officer of the year of the EPS. The Liberian leader also disclosed that the late Clarke was a hard-working officer whose contributions to national duties will remain on his mind and in the history of the EPS, especially long-serving VIP security officers at the Executive Mansion. 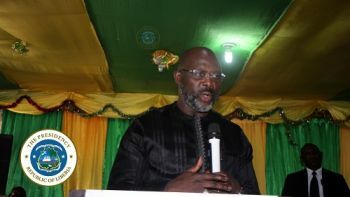 President Weah assured family members of the fallen officer of his continuous support, including taking personal charge of the welfare of two of his sons. The President called on the family to step out into the deceased’s footsteps, no matter how difficult it may be, to keep his dreams and wishes alive.